DEBORAH CROMBIE: Talking about reading books straight through the other day started me wondering how fast I actually read. Years ago--college days--I took a speed reading course. Even though I'd always been a fast reader, I thought it might help with college texts. As it turned out, any gains I made were surely lost to those biology books painstakingly highlighted with yellow marker, and I'd never worried about it much since. I read for work, and for pleasure, on printed pages and on all sorts of screens. But I've calculated, roughly, when I'm alloting my nightly reading time, that I read about fifty pages an hour. Therefore it makes sense that I read the new Charles Todd, No Shred of Evidence, which is a little over three hundred pages, in six to seven hours. But how fast is that, really? So I took a couple of tests. Here's one, from Staples. I tried several and tested a little under 400 words a minute, with 100% comprehension. Now the average is 200--400 words a minute, so this is not blazingly fast. 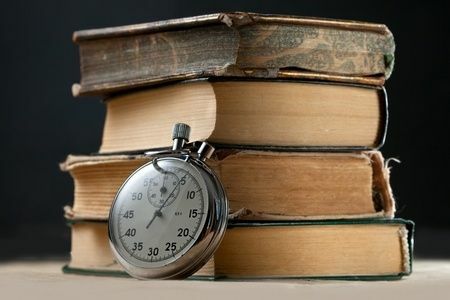 (Although I suspect when I'm at the crucial part of a good novel, I read considerably faster...) Some speed reading apps and programs claim you can learn to read as fast as 1000 words a minute. I did a little more research and discovered that speed reading has made a comeback, and that there are all sorts of different apps and different methods you can use to improve your reading speed. There are also lots of theories about the way reading on screens changes the way our brains process words. As you can probably guess, I found myself going down the information rabbit hole, and there is some fascinating stuff out there. But does reading faster actually improve your reading experience? My take, both from my very shallow bit of research, and from my own experience, is that it does NOT. While you may be able to hang on to comprehension, you are likely to lose emotional engagement. And if you read for language as well as story, appreciating good prose just takes a little time. However, there is a little nagging voice that says, "But given an hour-a-night reading block, I could read two books a week instead of one..."
What about you, REDS and readers? Do you know how fast you read? 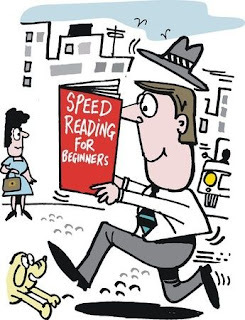 And are you tempted by the speed reading apps? While I have no trouble reading a book in a day, I don't try to speed read through my books because I want to immerse myself in the story, in the atmosphere of the book. Despite my teetering to-be-read pile, I can't say I'm particularly interested in the speed reading apps; I'm content with simply enjoying my books . . . . I notice that as I get older I do read more slowly. I'm a fast reader when I'm reading for information - but really what I'm doing is skimming, hitting the tops of the waves, as it were. It's why I really can't read poetry unless I actually read it aloud to myself, forcing myself to slow down and run it, word by word, through my brain, which is how a poem must be read. When it's a novel I know I'm really enjoying it when I'm not thinking about "how many pages til the end of the chapter" or "how long before the end of the book." Yep, I often find myself re-reading the endings of books at times--to go back and savor the story, the language. No speed reading except, like Hallie, when it's not for pleasure. And, like Joan, not at all interested in speed reading apps. My speed reading instructor (yes, I took both speed reading and speed note-taking the summer after my freshman year in college) pointed out that you can't read everything at the same pace. I'm also with Gram-- I read more slowly as I get older. Post cataract surgery, I fight massive floaters, and they seem to have slowed me down. my first reaction--Noooooooo! she wailed. Though I totally sympathize with wanting to read more, more, more. So interesting Hallie, about poetry. I'm reading Tracy K. Smith's memoir right now. She's a poet and I know I need to slow down and savor her wonderful words. When I was a lot younger, I was tempted to take a speed-reading course, mostly so I could read more books for pleasure. I never got around to it, though. I deliberately read certain types of non-fiction slowly, but I read mysteries as quickly as I can. I want to know what happened and how it came about. Because I am always reading more than one book at a time, I don't really know how quickly I read. Bedtime reading tends to be re-reading books I have enjoyed, a comfort-read kind of thing before falling asleep. Much of my bedtime reading consists of books of essays. Earlier in the evening is when I read fiction. I read several books a week. Sometimes I binge-read, as I did earlier this week, when I was too busy reading to respond to the post about binge-reading! I've sometimes gotten to the end of a book and because I enjoyed it so much, will immediately return to page 1 and re-read the entire thing! Because of the blog, folks assume that I read very fast, but this actually is not the case. Depending on the type of book (ie. how dense and complex it is), I typically read between 40-50 pages an hour. Still easily within the range to finish a book a day - if the time is allowed. Which bring me to the fact that I read ALL THE TIME. While I prefer to read in larger chunks of time, because of the demands of the blog, I do need to read every chance I get. So during the week, I will usually read for an hour in the morning before work, spend my lunch hour reading, and then spend an hour before dinner reading. That's when I take a break to spend time with the husband, watch our tv shows/movies. The rest varies, but I always get in at least another hour before bed, but if there is nothing exciting on or I am reading a particularly good book, I can get get in 2 or 3 hours instead. One of the weekend days is usually allocated to reading a book, while the other is for life. ;) I wouldn't want to read any faster, because I think you really do lose the connection to the art. I also think you don't retain the knowledge/plot as long, but I have no evidence to back that up. Sure, if I could read faster, I'd get even more reviewing done, but I think those reviews would suffer, so I'll stick with my average reading pace. I am like Kristopher only that read a lot. I read off and all, all day long. The TV doesn't get turned on until evening, and then only for a couple of hours. The computer is turned on in the morning to check mail, then is off for the rest of the day. I scored about like you did Deb, 381wpm and 100% on the comprehension. I read a book a day unless it is an 800 pager. Then it takes a couple of days. But I also have one or two going in the background, usually non-fiction. Those I may savor for weeks, dipping in and out. Right now I am reading a Catriona hard-to-put-down, scaring me half to death. Periodically I fall asleep and my kindle hits me in the face, wakes me up so I can read some more. There is nothing I would rather do than immerse myself in a good book. I took a speed reading course in high school--and it was SO valuable! As a result, I'm a very fast reader, so much that when I'm in a good book, I make a conscious effort to slow down. As a reporter ,too, it's so valuable to be able to skim documents for the outline of what I'm reading--if I just need to find the part about the rules, for instance--then go back and re-read for comprehension. I confess sometimes I get so caught up in the plot, I read really fast to find out what happens. Which, I know, is so unfair to the author! I have no interest in speed-reading classes or apps. I have a sense that I read quickly - I read the 7th Harry Potter book in 8 hours - but it very much depends on how interested I am in what I'm reading. I read the vast majority of What You See in about six or seven hours. In both cases, I was feverishly turning pages because I just HAD to know what was going to happen. I don't notice that my comprehension lags when I feel like I'm reading "fast," maybe because I had to read and retain so much as an English major in college. Perhaps what varies is not the amount of words I read an hour, but the fact that it takes so many more hours/days to read something when I'm not really engaged, because I'll put the book down to do other things. I can remember my father taking a speed reading course when I was a kid. I can still see his hands moving quickly down the page. I think they taught the reader to do that to help focus maybe? In any case, I used to read faster. I, too, as I've grown older read slower. And it's by choice. I no longer want to rush through a book - I like to stop and savor the words. That being said, I do certainly zip through when the action or story warrant it, but I also find myself going back and rereading the ending or sometimes the whole book. I like to look for a phrase that really speaks to me in the narrative and perhaps include it in my review if I write one. As I've come to the conclusion that I won't get to read all the book I'd like to, well, I might as well bask in the beautiful words. Nice topic. Thanks for the link to the test, Debs. It was an interesting exercise. My score was about what I expected, 391 words with full comprehension. However, I was going through my Nook books the other day, listing the ones I've not yet read in OneNote. (The Nook app used to let you mark them as "read", but some ninny had to go and improve it so you no longer can.) Some I could remember reading, but others I had to open to see where I left off. If I'd read them the book opens to the last page. Which was the case with one book, almost 500 pages, that I have zero recollection of reading. The book club questions in the back might as well have referred to a text on Sanskrit, for all the sense they made to me. How does that happen? I can skim effectively when I need to get the gist of an article or book but for a good book I like to savor every phrase and I am so depressed when I come to the end. Mary, I cannot hear that enough..thank you!!! SO thrilled..
And yes, I so agree that the quality of the book makes such difference. Hi Caroline! Waving at you! And looking forward to talking about No Shred of Evidence on the blog tomorrow! This is such an interesting discussion. The more I think about it, the more I find I don't want to read faster. I want to read poetry, with care. And I want to read non-fiction--there are so many things I'm interested in learning about, and I know if I don't read slowly, I won't retain the material. Here's an interesting article that covers some of the things we've talked about, and lots more. And here's a fun thing: You can get an excerpt of a non-fiction book delivered to your inbox every day. I'm with you, Debs. Why do we have to become faster at everything? I'm having an issue with that in a general way, in modern life. I'd prefer to slow down and go deeper -- and that includes reading. I get the sense that I'm not a particularly fast reader anyhow; sometimes I feel like I'm not reading so much as absorbing the words ... I love that feeling. I'm a naturally fast reader, which has helped in my academic years and is now sometimes a trial to me - I wish I could make a good read last longer! My reading pace actually made literary fiction difficult for me - I kept whipping past the language to find out WHAT HAPPENS. Then I started listening to lit fic in audiobook form, and it made a huge difference. It forces me to slow down and appreciate the subtleties of the work. Agreed with everyone saying "Why go faster?" It's like food - better to slow down and enjoy every bite. Series that I love, I have no problem reading the book in one day, though with Debs and Elly Griffiths books, I do try to space them out over a few nights knowing it will be a year or so before there is another one. Ah, Debs, you've hit on a subject that plagues me. On the average, I'd say I'm a slow reader, and with all the books always waiting for me and reviewing for my book blog, that's a huge disadvantage. But, I think last year and my unavoidable delay on reading this year has probably made me feel very slow. You know, the whole Stella getting her groove back thing. Well, I'm finally making some progress on that, but I'm still not the fast reader that you or some people are. And, then I think, how quickly I'm reading through Kristi Belcamino's Gabriella Giovanni series (finishing the last one out today), and I guess that it's like you say. Sometimes you just find yourself, slow or fast reader, running through pages of certain books. I love when a Reds' book comes out because I know that it will be a faster read for me, with my absolute undivided attention. My norm was, before I had my really slow year last year, is a couple of books a week, and I can exceed that depending on the length of the book and if it is in a series that I'm gobbling up. One thing that I know slows me down is using the sticky tabs to mark places in books, but it's helpful in reviewing and fun to go back and see what I thought was noteworthy. When I met Jamie Ford, author of Hotel on the Corner of Bitter and Sweet, he was thrilled with all the post-it tabs I had in that book and his other book, Songs of Willow Frost. He insisted we take a picture showing the tabbed books. He is a sweetheart, in case you haven't met him. Debs, I'm glad you brought up the point that reading faster doesn't really improve one's reading experience. I have a friend who truly is a speed reader and goes through many books a year, but I always remember what I've read better than she does. She often picks up books that she's already read and starts reading them again because she doesn't realize she's read it before until she gets into reading it again. I don't think I've ever done that. In fact, I sometimes tell her that she's read that book before when she checks a book out of the library that I remember her reading. I seem to remember her books better than she. Hahaha! Kathy Reel, lucky you! I loved Hotel on the Corner of Bitter and Sweet!! I can identify with what Kathy Reel said about her friend. I have always been a naturally fast reader. I remember the agony of trying to read slowly because I could only borrow two books twice a week from my elementary school library in the summertime. When I was working, I read about 120 books a year. Last year I retired in early May, and I read 170 books that year. For 2016 it's about 4 books a week so far. One of the reasons I keep track is that I have been known to get two-thirds of the way through a book and notice it was suddenly sounding a bit familiar--I had read it the previous year. However, I liked it just as much the second time around so it wasn't a waste of time! It's not that I want to speed through a book--that's just me. When the prose is beautiful and I want to savor every word, I do consciously slow myself down. However, if I'm not interested in something, I will skim it until I get interested again (I usually don't rate those books very high on my personal scale). My husband reads much more slowly, but he can remember details of books we both read several years ago. I don't seem to retain much at all. My son can tell you any detail about all of the Harry Potter books, but not I. The Staples quiz says I read 73% faster than the average, with 100% comprehension. It does help me work through my never-ending to-be-read list, and reading is one of my greatest joys. But I don't read all day, every day, just up to an hour first thing in the morning and in between other activities. Reading just before bed, unfortunately, leads to instant dozing, unfortunately. To shift the subject a little. Sadly with the time restraints I-we--all face,my biggestproblem is finding time to find new writers to love. There are my greatfavorites,authors I don't want to miss.So I will pick up a new writer and give him/her a chance,but I often have to read in less than idealconditions.Notfair.But I also realize that.So I try to read well. I discovered Ann Cleeland's fun series with a scotland yard detective from the nobility and hisIrish sergeant.I started it on a plane,gotcaught upin her humor and great stye--a bitof GeorgetteHeyer there,and atouch ofCatriona--andfound a new author. Not my usual fare,but I love variety and look for it.You mustnever say no to new! A fresh persective on the genre keeps us fresh as writers. I agree with you, Caroline -- there are so many great unknown-to-me writers out there. This is one of the reasons I come back to JRWs -- discovering authors and also keeping up on the new releases from the tried-and-trues. 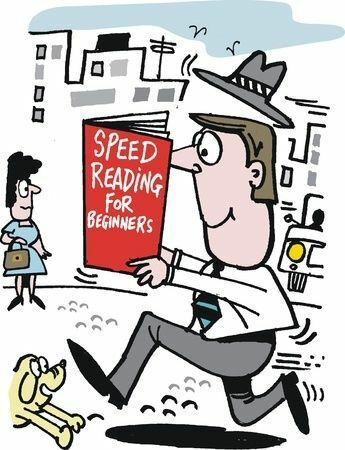 I took a speed reading course in college and loved it. Definitely helped me get through all those text books faster so I could get back to reading for pleasure. I find I read slower on the screen than I do on an e-reader or a paper page. I agree with Deb. Sometimes I will get to the end of a book with beautiful language and go right back to page 1. I have no desire to speed read through a pleasure book. I want to go slow and savor every word.